I got a package this week from Brian of the blog Collecting Cutch. He recently held a contest where he asked participants to predict when Andrew McCutchen would hit his 200th home run. I didn't win the contest, but I did pick a day that McCutchen hit a a home run, #201, so Brian being the awesome guy that he is, sent me a sweet package. 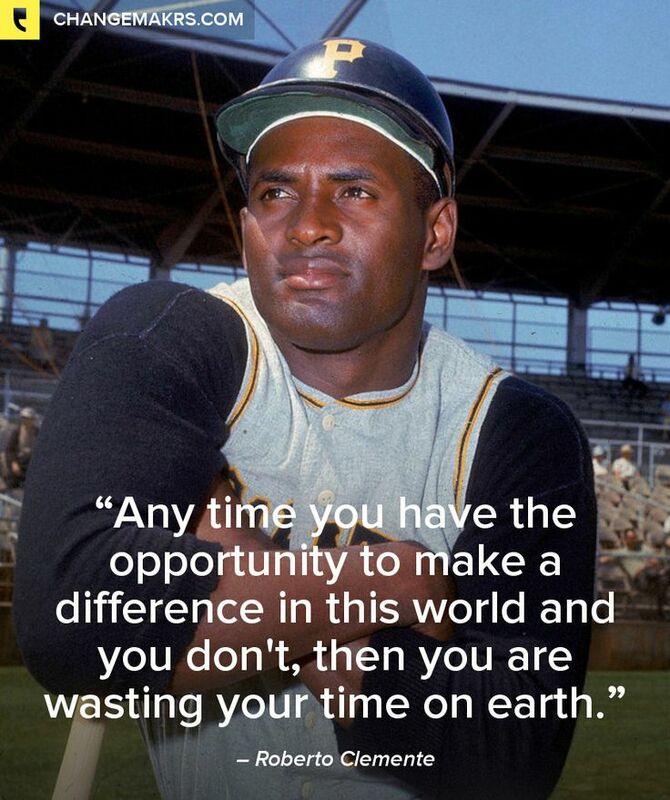 Before you read any further go check out his post about Roberto Clemente. Now, follow Brian's lead and do something good for someone else today. 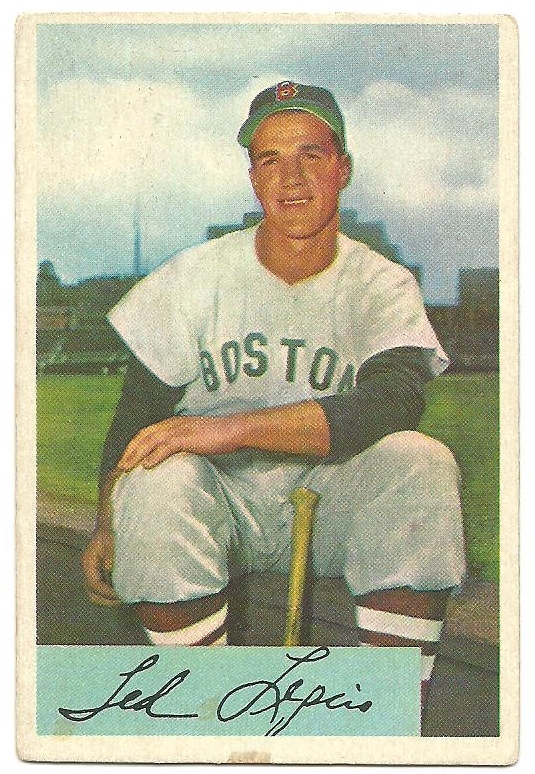 Let me know that you did something good for someone else this weekend and I'll enter you into a little contest to win this 1954 Bowman card of Boston Red Sox Ted.....Lepcio. You don't have to tell me what you did if you don't want to, just that you did something. Big or small, as long as you did something to make a difference in the world, your entered into the contest. Now, let's take a look at some of the cards that Brian sent me. 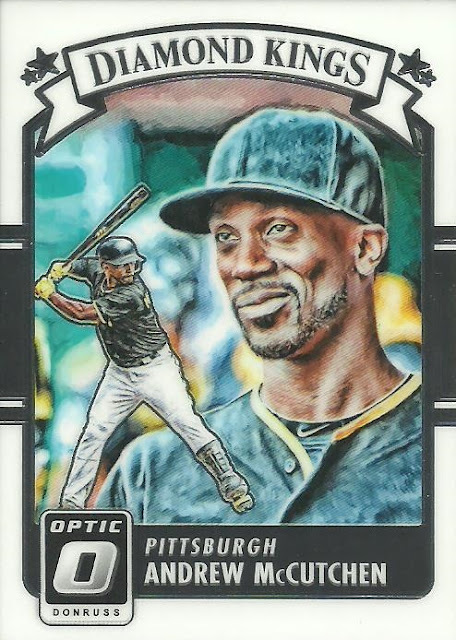 First up are two McCutchen cards. These may have accidentally fallen in or Brian may have included them because my McCutchen collection is currently as weak as 2015 Mark Buehrle fastball. 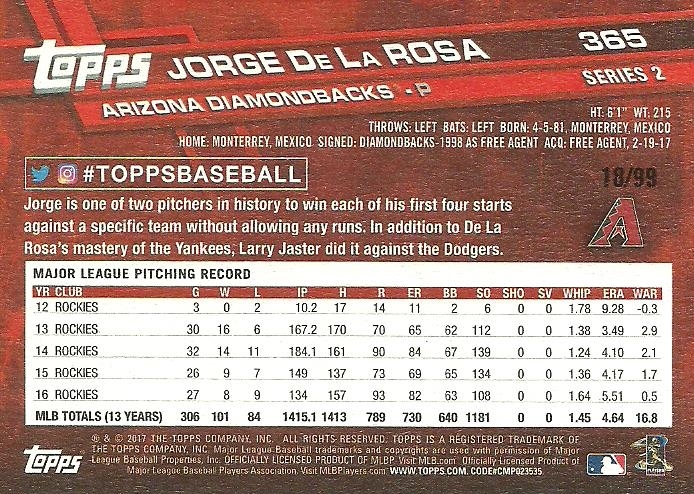 Check out this vintage stock Jorge De La Rosa card. Jorge has been a decent addition to the D-Backs bullpen this season as he made the transition from a starter. 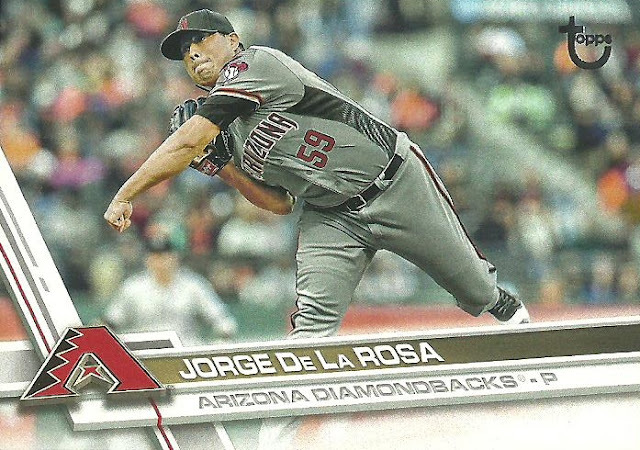 Fun Fact: Jorge De La Rosa is the Colorado Rockies all-time leader in Wins (86) and Strikeouts (985). 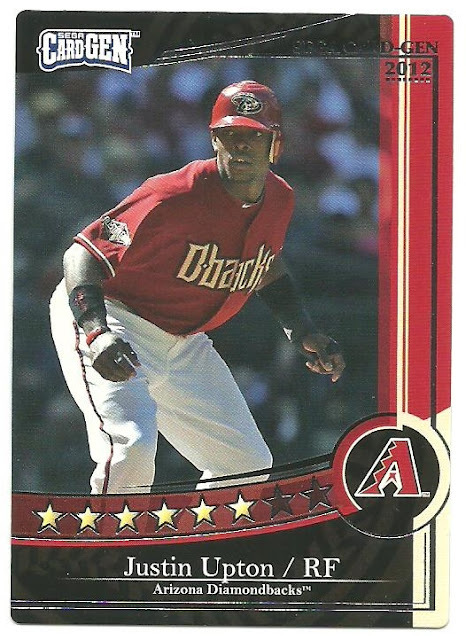 The card is numbered on the back out of 99. These Sega CardGen cards are awesome! 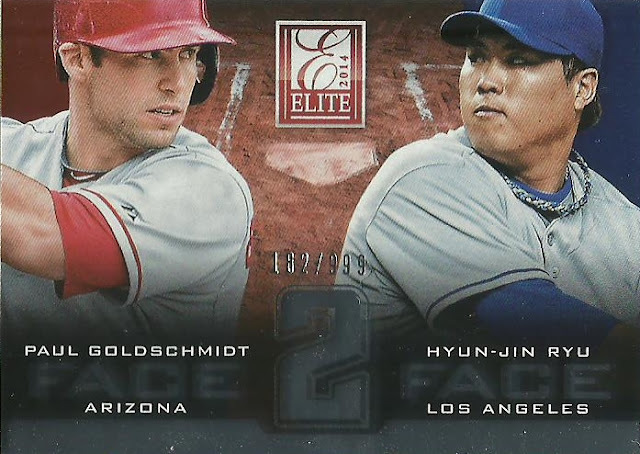 Here's a numbered Goldschmidt that I needed! 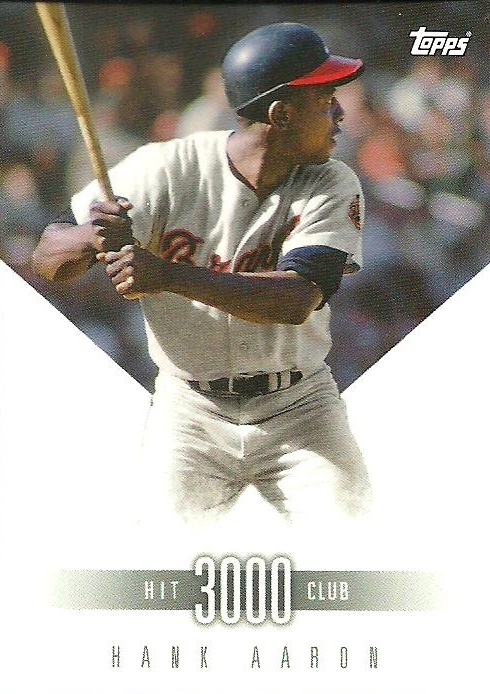 This 3000 Hit Club card of Hank Aaron is so simple, but I love it! 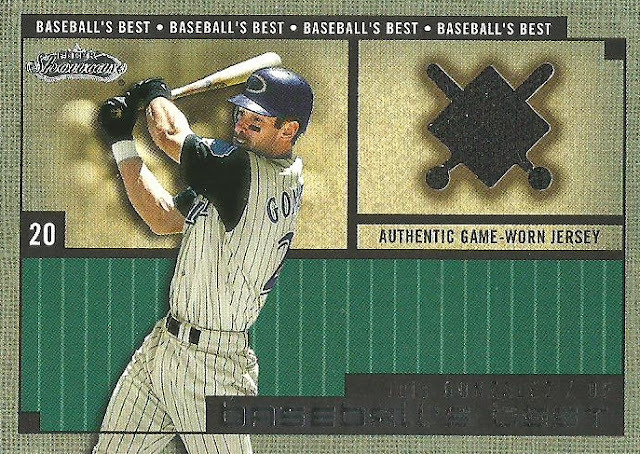 Finally, a sweet jersey card of Gonzo! Thanks again Brian for a great batch of cards! Now go make the world a better place! 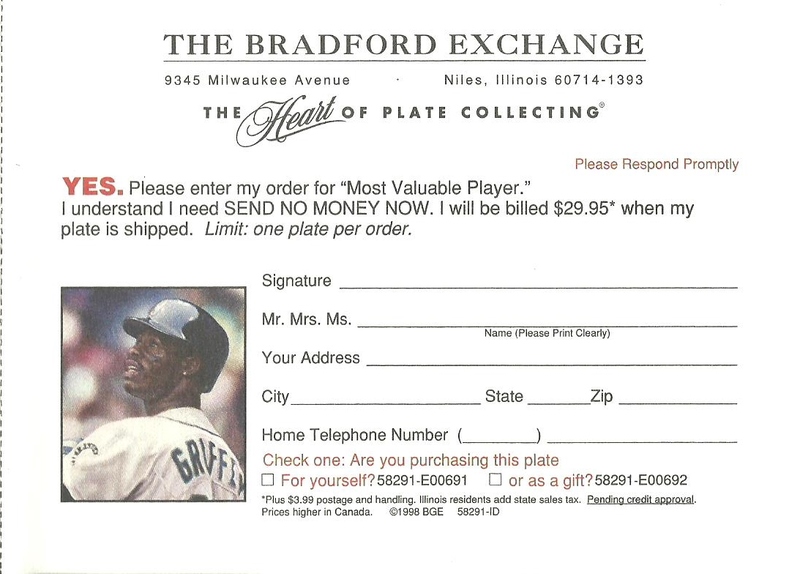 Keeping with the Griffey theme of the magazine, page 13 of the November 1998 issue of Beckett Baseball Card Monthly magazine features a full page ad for a collector plate made by the Bradford Exchange. This was the inserted in the magazine so an order could be sent in. I don't have this particular plate, but I do have one collector plate and it is a Bradford Exchange plate of Ken Griffey Jr., but with the Cincinnati Reds. I was given this as a Christmas gift one year by a friend. 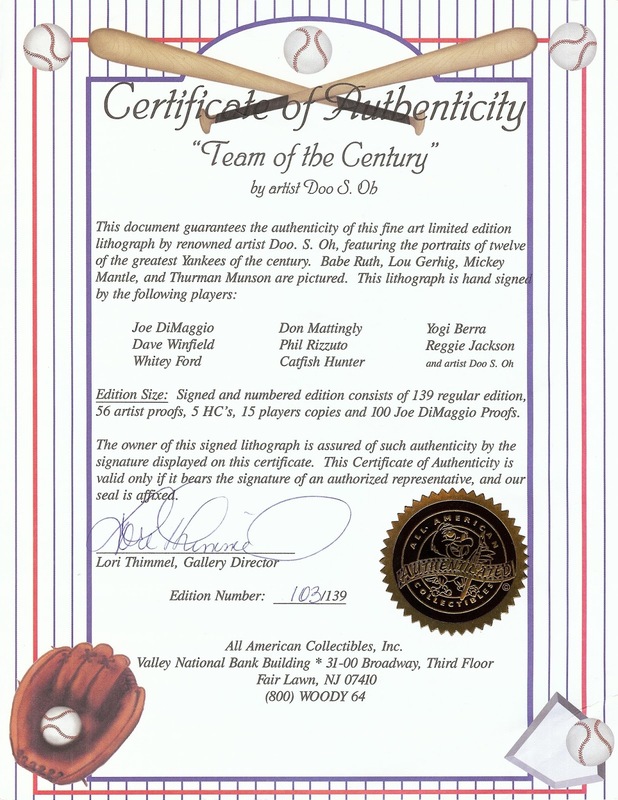 It includes a Certificate of Authenticity and on the back it includes information on transferring ownership, which I think is really interesting. How about you? Do you own any collector plates? Let's see them in the comments. 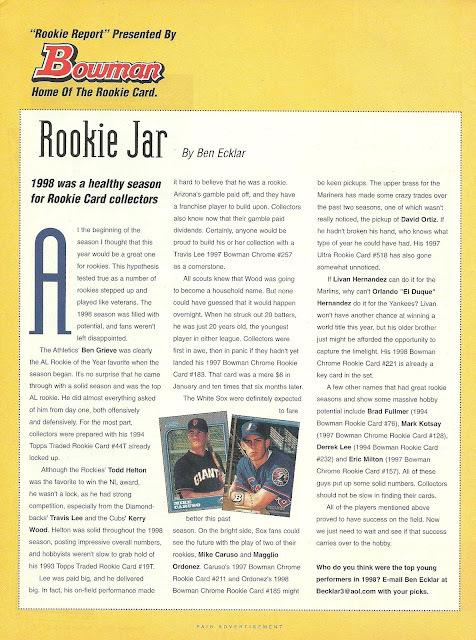 Page 12 of the November 1998 Beckett Baseball Card Monthly magazine discusses the 1998 rookie class in the "Rookie Report" Presented by Bowman Home Of The Rookie Card. 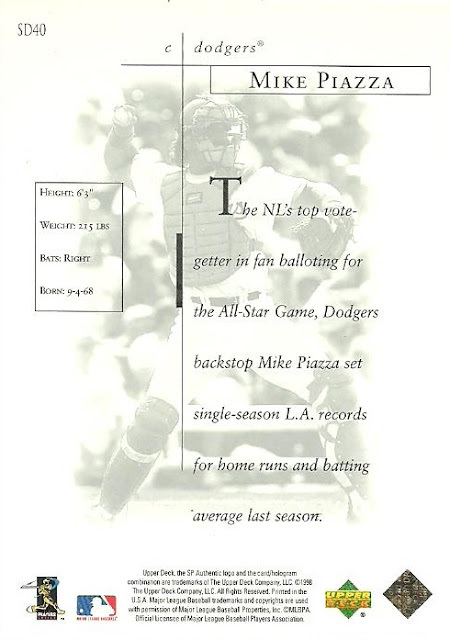 20 years later, I'm going to take a brief look at the career of each of the rookies that are mentioned. Ben Grieve - Played from 1997 - 2005. 1998 A.L. Rookie of the Year. 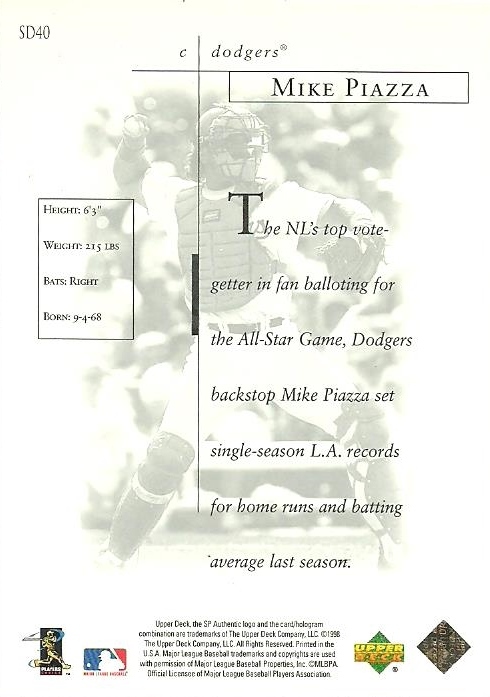 All-Star in 1998. 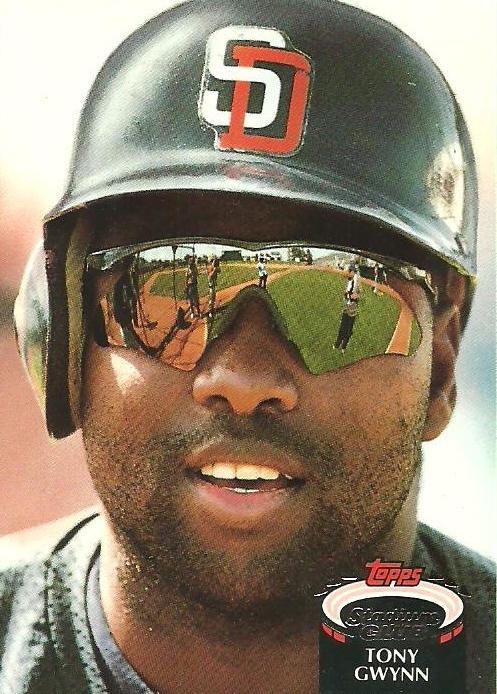 Career .269 BA, 118 HR, and 492 RBI. Todd Helton - Played 1997 - 2013. 5 time All-Star (2000 - 2004). 3 time Gold Glove winner. 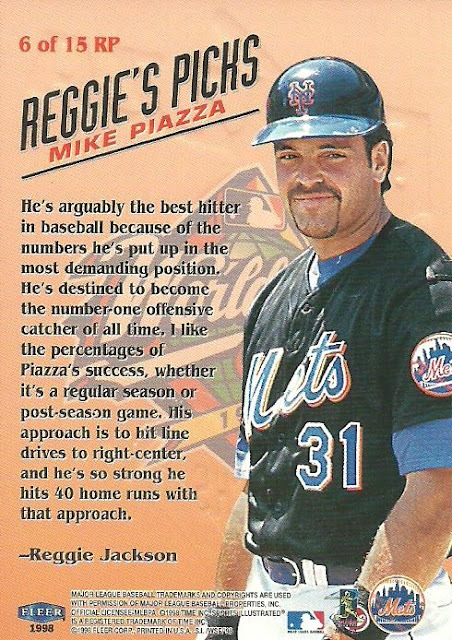 Career .316 BA, 2,519 Hits, 369 HR, and 1,406 RBI. Travis Lee - Played 1998 - 2006. Career .256 BA, 115 HR, and 488 RBI. Kerry Wood - Played 1998, 2000 - 2012. 1998 N.L. Rookie of the Year. 2 time All-Star (2003 and 2008). MLB record 20 strikeouts in a 9 inning game. 86-75 Win-Loss , 3.67 ERA, and 1,582 strikeouts. Mike Caruso - Played 1998 - 1999 and 2002. Career .274 BA, 7 HR, and 90 RBI. Maglio Ordonez - Played 1997 - 2004. 6 time All-Star (1999-2001, 2003, 2006, and 2007). 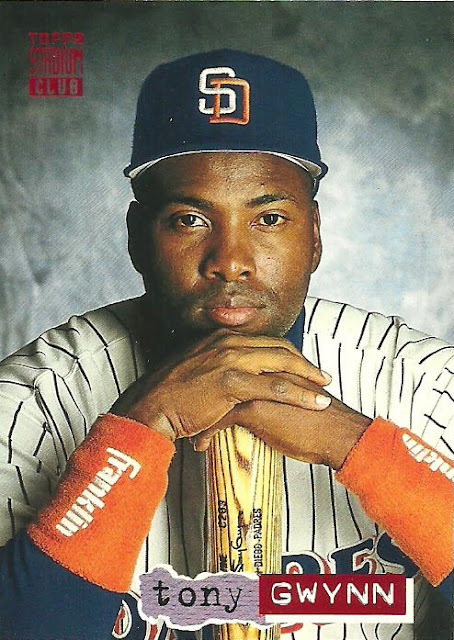 Career .309 BA, 2,156 Hits, 294 HR, and 1,236 RBI. David Ortiz - Played 1997 - 2016. 10 time All-Star (2004 - 2008, 2010 - 2013, and 2016). World Series MVP (2013). 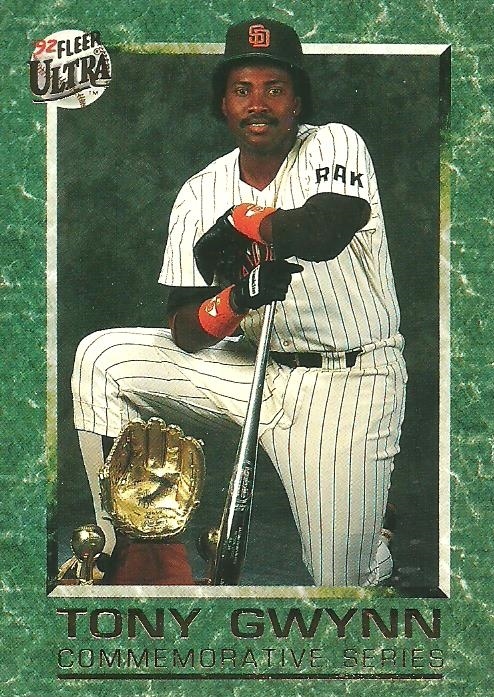 Career .286 BA, 2,472 Hits, 541 HR, and 1,768 RBI. Orlando "El Duque" Hernandez - Played 1997 - 2002 and 2004 - 2007. 90-65 Win-Loss , 4.13 ERA, and 1,086 strikeouts. Brad Fullmer - Played 1997 - 2004. Career .279 BA, 114 HR, and 442 RBI. Mark Kotsay - Played 1997 - 2013. Career .276 BA, 127 HR, and 720 RBI. 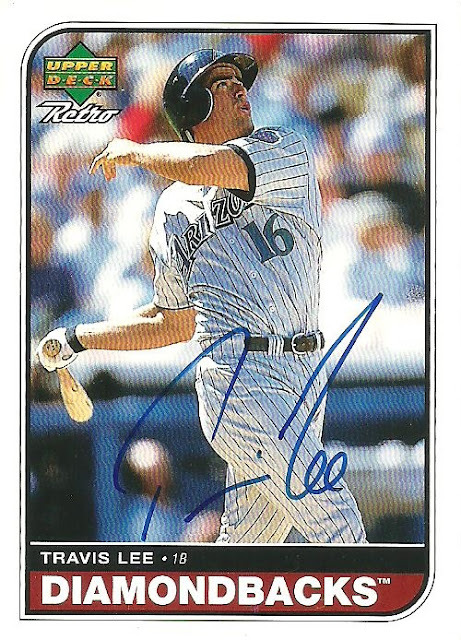 Derek Lee - Played 1997 - 2011. 2 time All-Star (2005 and 2007). Career .281 BA, 331 HR, and 1,078 RBI. Eric Milton - Played 1998 - 2009. 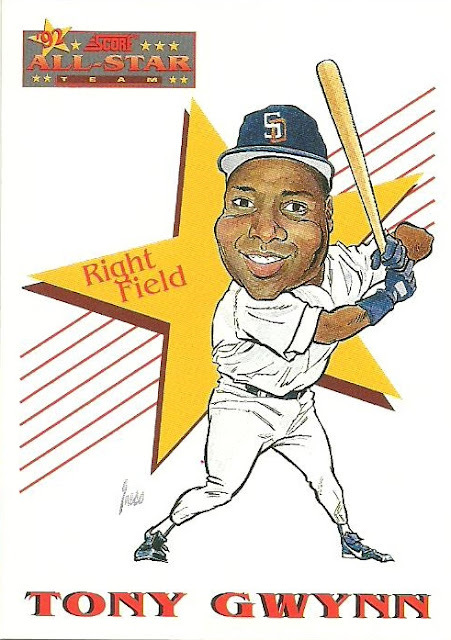 All-Star in 2001. Pitched a No-Hitter in 1999. 89-85 Win-Loss , 4.99 ERA, and 1,127 strikeouts. It's so hard to compare players even players from the same era. I think most people would agree that David Ortiz and Todd Helton will end up in the Hall of Fame. Take a look at Maglio Ordonez's career numbers. What would his career numbers look like if he had played as long as Ortiz and Helton? 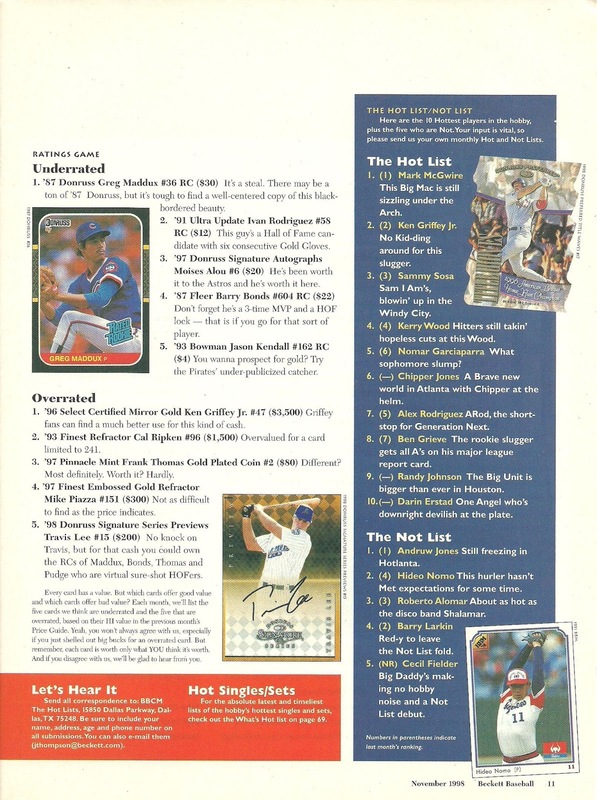 More lists on page 11 of the November 1998 Beckett Baseball Card Monthly magazine. On the right hand side of the page we have a slight variation to the typical Hot and Cold Lists that Beckett usually produces. We have "The Hot List" and "The Not List". Probably only three, maybe four, Hall of Famers out of the 10. Two out of the 5 on the Not List are in the National Baseball Hall of Fame. On page 10 of the November 1998 issue of Beckett Baseball Card Monthly we see a feature called The Hot Lists. The Hot and Cold Lists are something that I remember well from Beckett magazines, but these aren't the typical Hot List that I'm familiar with. Looks like this might be the first of it's kind, but I'm not certain. It states, "In preparation for the new millennium, we'll call out five cards of a particular player with a combined value of no less than $2,000. Sure, most of us can't afford these gems. But hey, window shopping's free." Window shopping indeed. 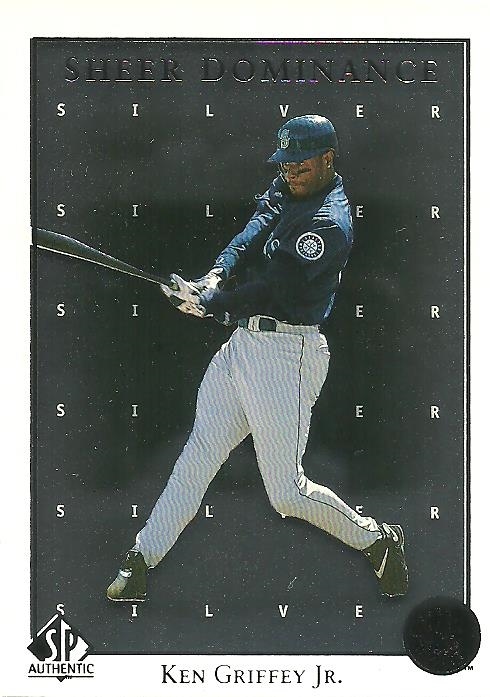 These Griffey cards have not only maintained their value, but most have increased in value significantly, if you can even find them. 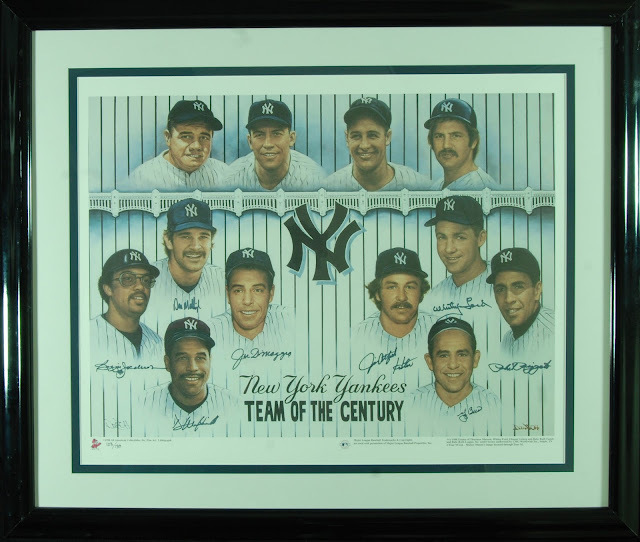 For example, here is a PSA 7 copy of the 1998 Skybox E-X2001 Destination Cooperstown card on ebay with an asking price of $649.99. This is probably the first list of its kind as well. Readers get to submit a list of cards that they would like that add up to exactly $100. 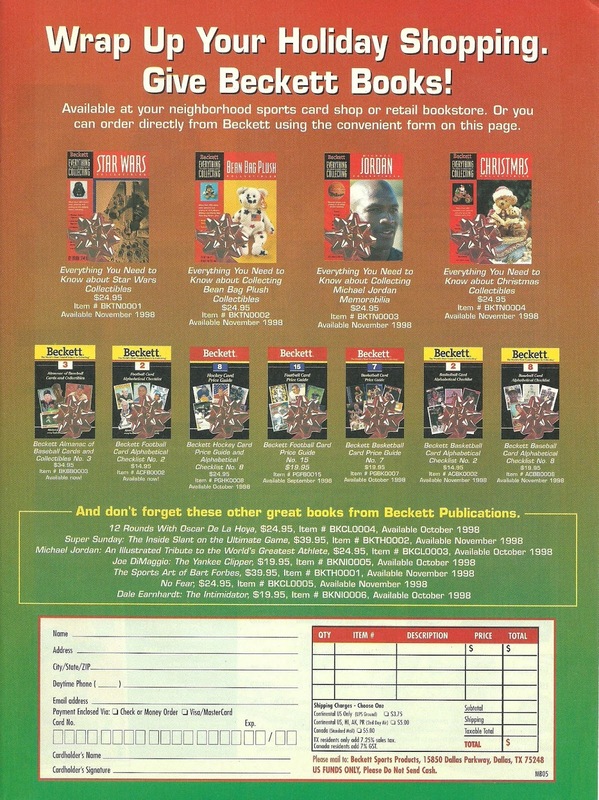 In December 1999, Beckett will select one list that was published and award the person who submitted the list with a $100 bill. This particular list was submitted by Jim Thompson of Dallas, TX who happens to be the Associate Editor of the magazine and obviously a Boston Red Sox fan. Hard to believe the 1992 Topps Traded Nomar Garciaparra RC was priced at $50 at one point. 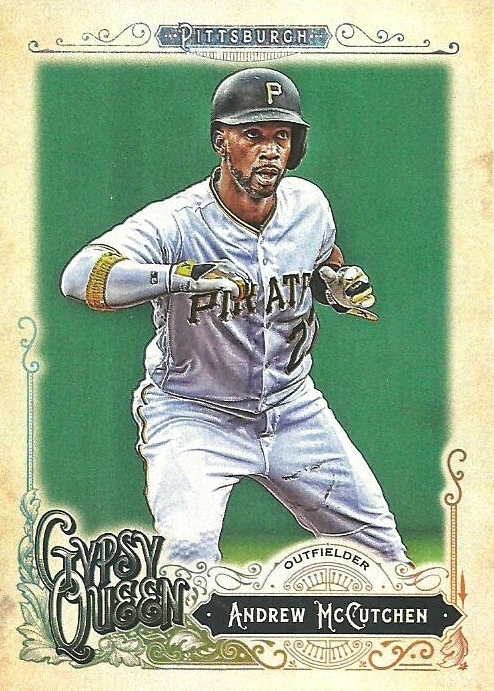 The card can be picked up today for between $5 - $10 shipped on eBay. I picked one up couple months back as part of a large lot I picked up at card show that included an entire 1992 Topps and Topps Traded set. I got the entire lot for $20. This particular group lists vintage cards from a particular subset and this particular one deals with 500 Home Run Hitters. Depending on the condition of the cards on this list, the price would be well over the $2,000 mark. Lots of nice cards on this list. 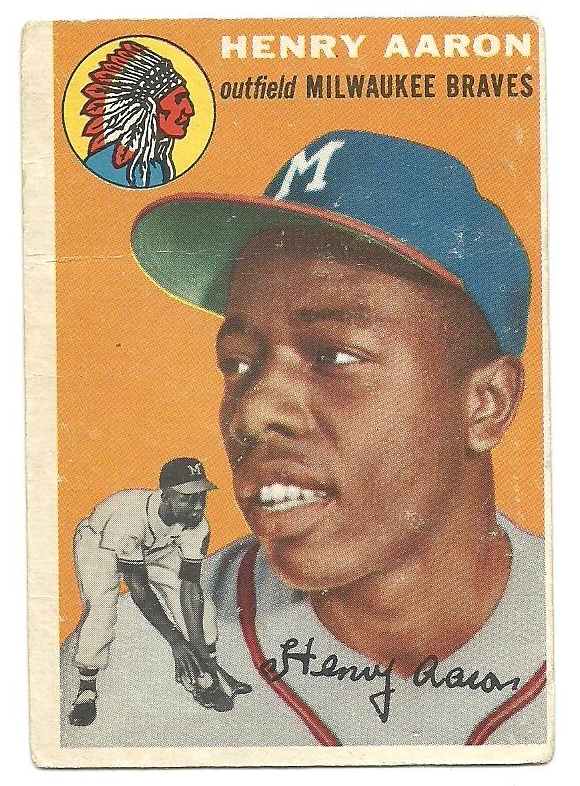 I only have one in my possession; the 1954 Topps Hank Aaron RC. Anyone else have any cards on the Golden Oldies or the 2000 Club lists? 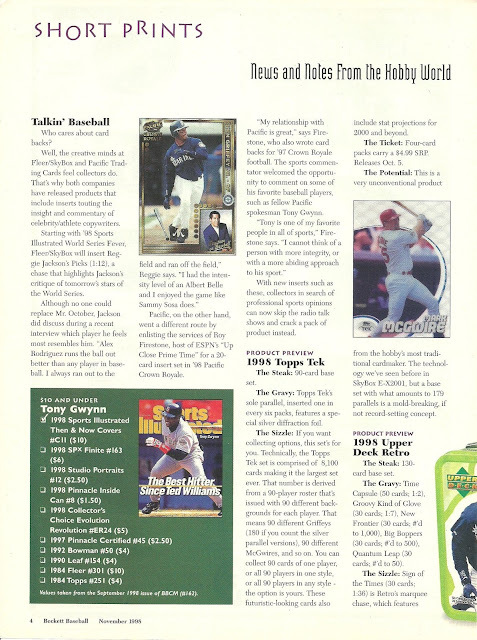 Page 9 of the November 1998 issue of Beckett Baseball Card Monthly features a full page add for other Beckett publications. 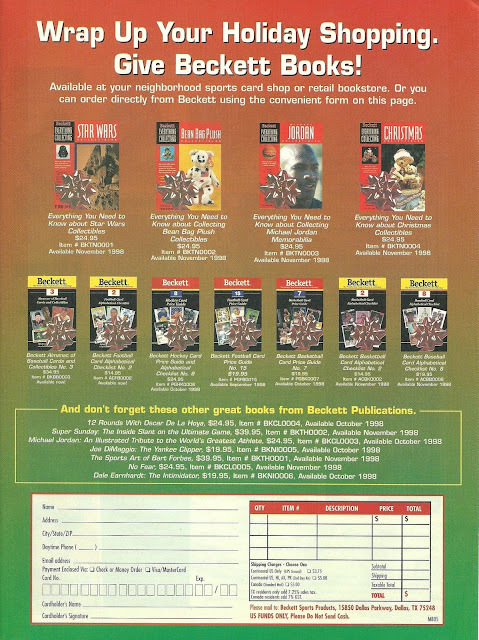 In addition to the typical sports cards books, there is one for Star Wars collectibles, Bean Bag Plush collectibles, Michael Jordan Memorabilia, and Christmas Collectibles. Sometimes I forget just how popular Beanie Babies were back in the day. Page 8 of the November 1998 issue of Beckett Baseball Card Monthly gives us more Short Prints and we get a look at something called Scattershots. If you thought Short Prints were "short", then Scattershots are tiny snippets about the hobby. 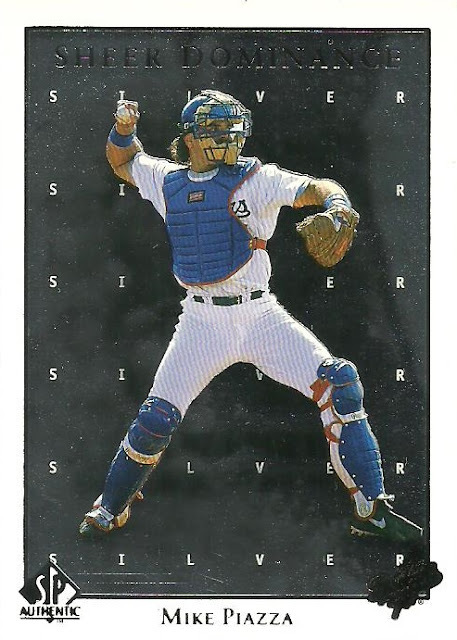 We first learn that the 1998 Bowman Chrome Orlando Hernandez RC was not short printed. The article states "it was printed in different quantities, but was inserted at the same rate as every other base card in the set". 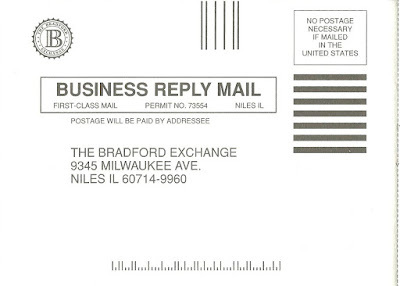 Not sure why it was "printed in different quantities" but "inserted at the same rate as every other base card". Anyone have any thoughts on this? The Yankees "Team of the Century" Lithograph is show without the autographs that raise the price to $3000. I wasn't able to locate any currently for sale, but I did find one that sold in 2014 for a meager $634.00, a far cry for the $3k it originally cost. Here is the signed and framed version along with the COA. 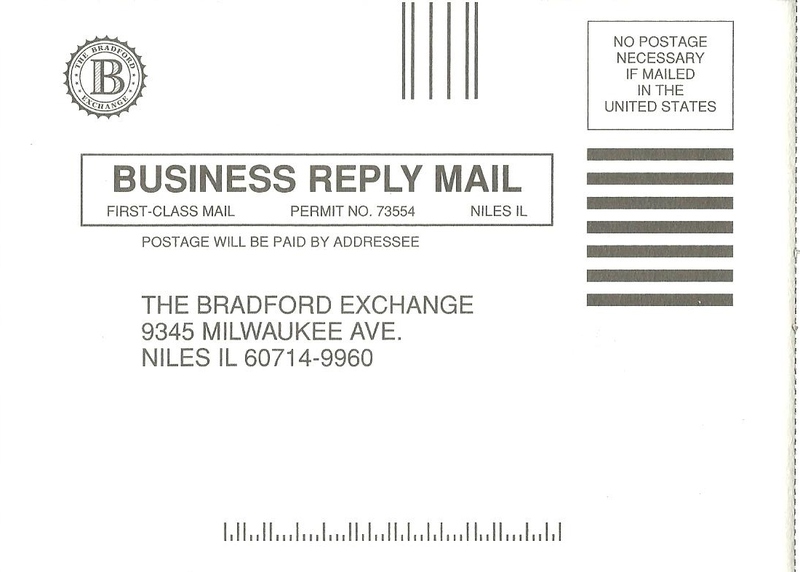 This particular copy is numbered 103/139. 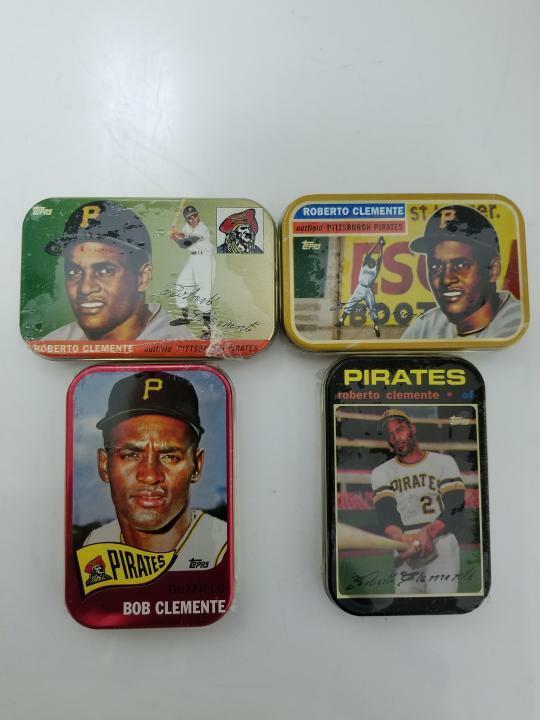 Next up is a snippet about Roberto Clemente tins which include a hermetically sealed reprint of one of his cards. There are four different tins, which can be seen below. If you want to purchase them you can pick them by clicking here. I actually have one of the hermetically sealed cards from one of the tins and didn't even realize it. This came from a 15/$1 box at my LCS recently. 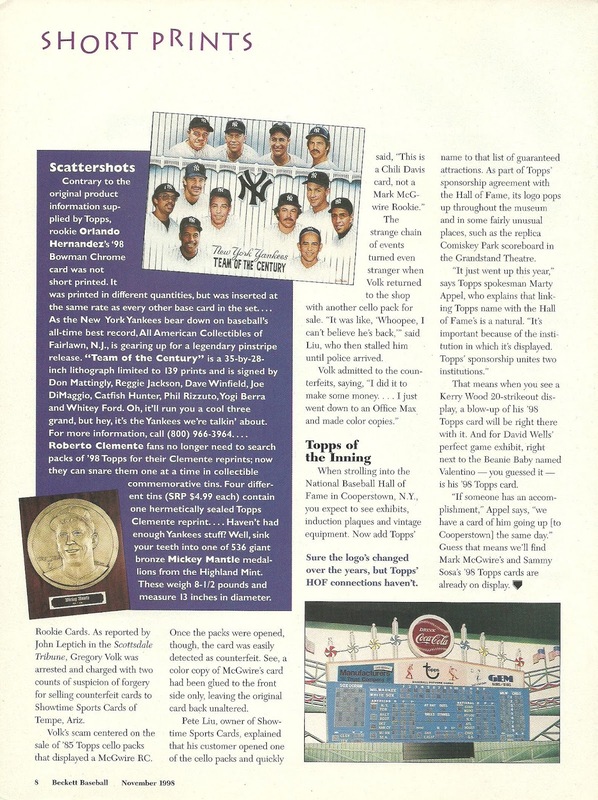 The last "scattershot" showcases a 8 1/2 pound medallion featuring New York Yankee great Mickey Mantle. We get a look at the medallion in the magazine, but I was able to find a better picture from ebay. Here we learn of a partnership between Topps and the National Baseball Hall of Fame. I've been to the Hall of Fame once, in 1997, so it was before this partnership. Not sure if the partnership remains to this day. Anybody been to the Hall of Fame recently that can confirm? Only one home run to go! Make sure you enter Collecting Clutch's contest and predict when Andrew McCutchen will hit #200! He just hit #199, so you don't have much time left. 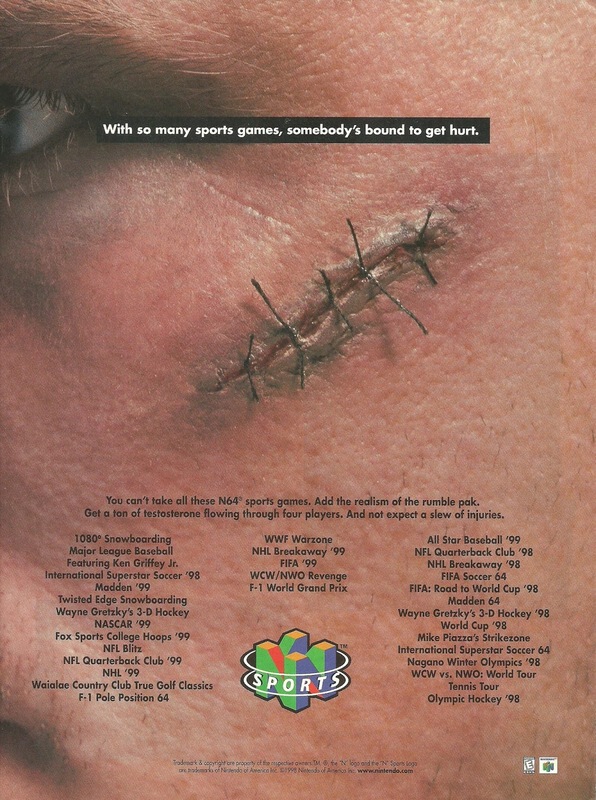 Today we'll take a look at page 7 of the November 1998 issue of Beckett Baseball Card Monthly magazine which is a full page ad for N64 sports games. I had an N64, but didn't have a ton of games. NFL Blitz 2000, was my favorite N64 game. Obviously this advertisement is from 1998, so NFL Blitz 2000 isn't on the list. The only game on the list that I actually had was 1080 Snowboarding. It was given to me as a gift one year by somebody I worded with. It was a nice gesture, but not a game I would have picked out myself. Who had an N64? How many of these games did you have? I read an interesting article in ESPN magazine a few months back about video game collectors. Some games are extremly rare and go for big bucks. With video games the real money is in the packaging. 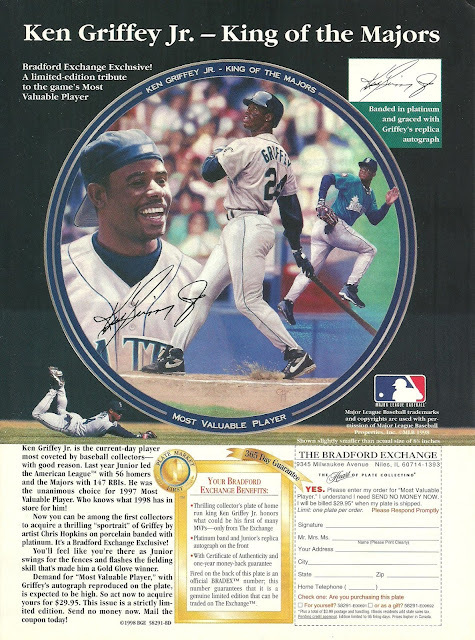 For example, a used copy of Major League Baseball Featuring Ken Griffey Jr. goes for $5-$10 on ebay, but a copy in unopened packaging is up for grabs at 5 to 10 times that amount. 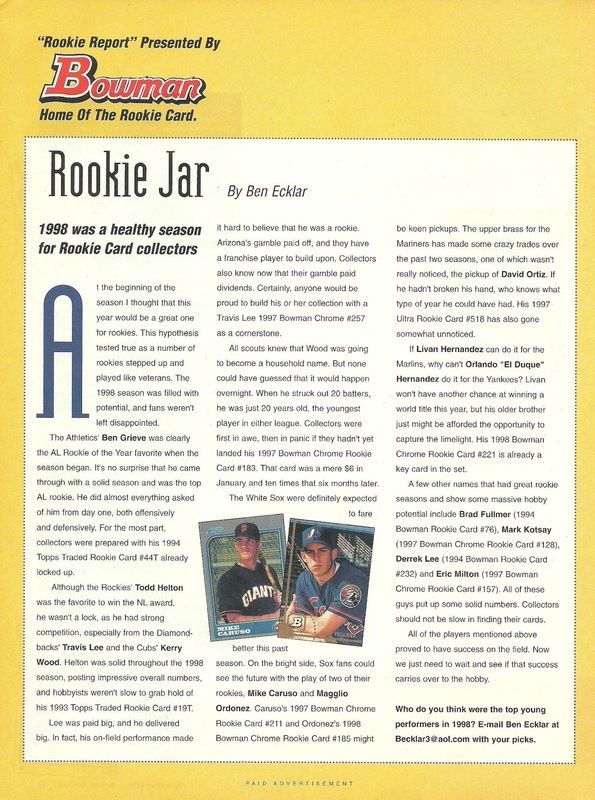 Today we'll take a look at more Short Prints on page 6 of the November 1998 issue or Becket Baseball Card Monthly magazine. 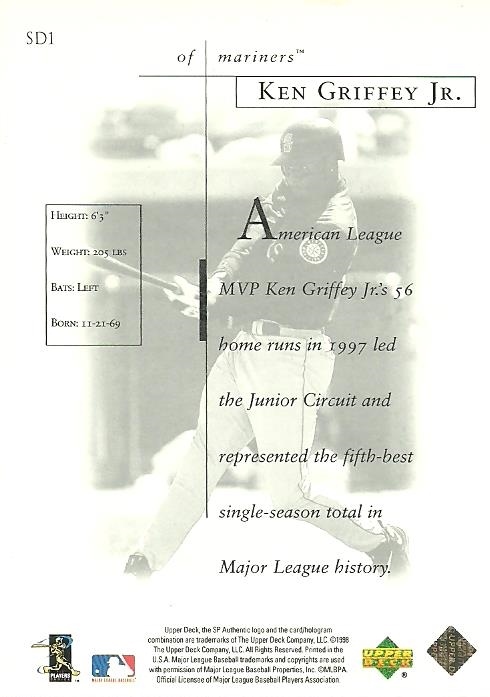 The page starts by finishing an explanation as to why a 1998 card of Ken Griffey Jr was used for the Vintage Card segment. Chrome Team - I tried to find more information about these 11 x 14 chrome plated photographs, but came up empty handed. I could only find one article online with any mention of the product and it was referencing it regarding Randy Moss. All of the companies involved appear to be long gone and I couldn't find any of the chrome photos on ebay, which I find odd because these were issued nationally through Wal-Mart and JC Penny catalogs. If anyone has any information about these, please comment below. Game Used -Front Page Sports: Baseball Pro '98 - I've never been a big online gamer and have no recollection of this game. I was able to find a web site with a review of the game and it looks like the game can be downloaded from the site, but like I said I've never been one to play games on my PC and I'm always afraid of downloading stuff from unfamiliar sites. If you want to purchase the game it can be found on ebay for less than $10 shipped. Sweet Shot - 1998 Fleer Jay Buhner #68 - Great looking card! I thought I might have it, but I looked through my Buhner cards and came up empty handed. We learn that the photographer for the photo used on this 1998 Fleer card is Mitch Haddad. I was able to find a little bit online about Mitch, but it doesn't look like much has been updated since 2011. Copy Macs - This article starts on page 6 and finished on page 8. 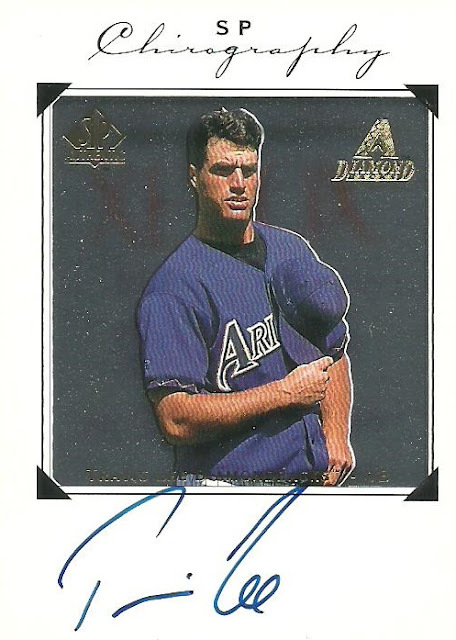 It tells the story of Gregory Volk who walked into Showtime Sports Cards in Tempe, AZ during the summer of 1998 with the hottest card on the planet on the front of a sealed cello pack of 1985 Topps cards. Gregory sold the pack to the owner of the card shop, but when the pack was then sold to a customer it was discovered that they McGwire was merely a color photo copy pasted onto a Chili Davis card. Volk would have gotten away with it too, if it weren't for those meddling kids...I mean, he would have gotten away with it if he hadn't gotten greedy and returned to Showtime Sports Cards with another cello pack with McGwire on the cover. The shop owner was able to stall Volk until the police arrived. Volk admitted to making the copies at an Office Max. Here's a great article by fellow blogger Patrick Greenough of Radicards.com on "How to Spot Fake 1985 Topps Mark McGwire Rookie Cards". 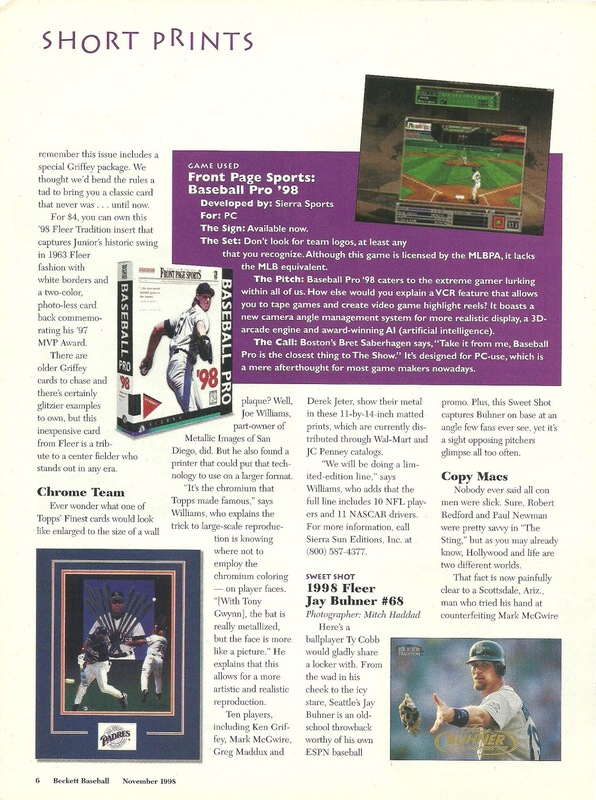 Today we're going to take a look at page 5 of the November 1998 Beckett Baseball Card Monthly magazine. 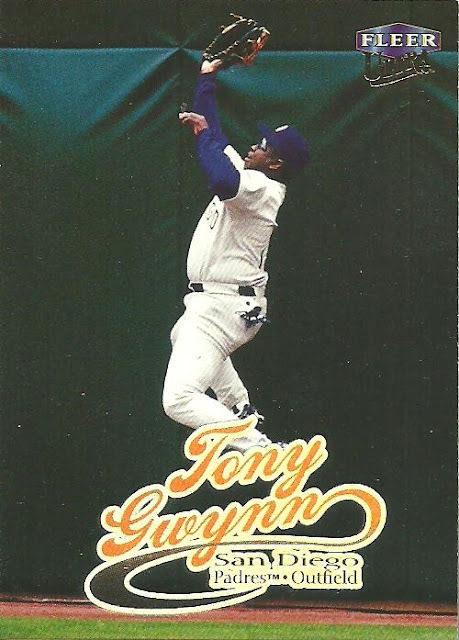 First, we'll finish off Product Preview of 1998 Upper Deck Retro. On this page we get a look at the rest of the packaging, which is a metal lunchbox. There were six different lunchboxes available. The one pictured features Ken Griffey Jr. Here is the list. 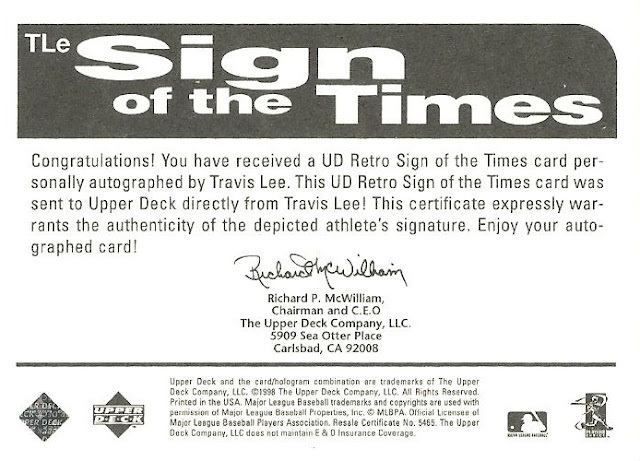 It isn't mentioned in the Product Review, but 1998 Upper Deck Retro also included one of the first examples of a cut signature. Upper Deck obtained an autograph album with not one, not two, but three Babe Ruth signatures. They cut the signatures out of the album and created three Babe Ruth cut signature cards for 1998 Upper Deck Retro. 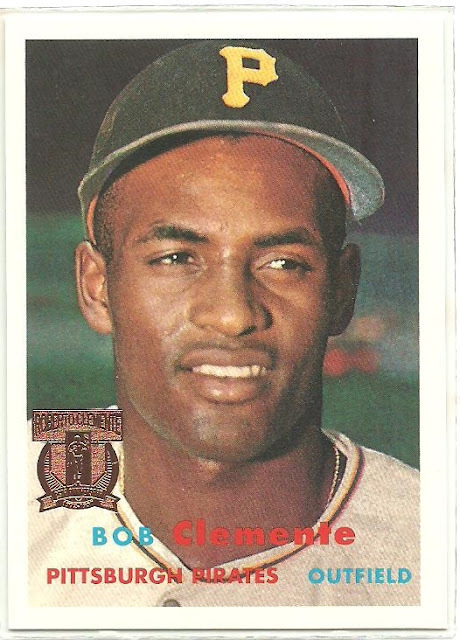 I did some searching, but was unable to locate a picture of one of the cards. If I had to guess, they have probably been tucked away in a safety deposit box for nearly 20 years. 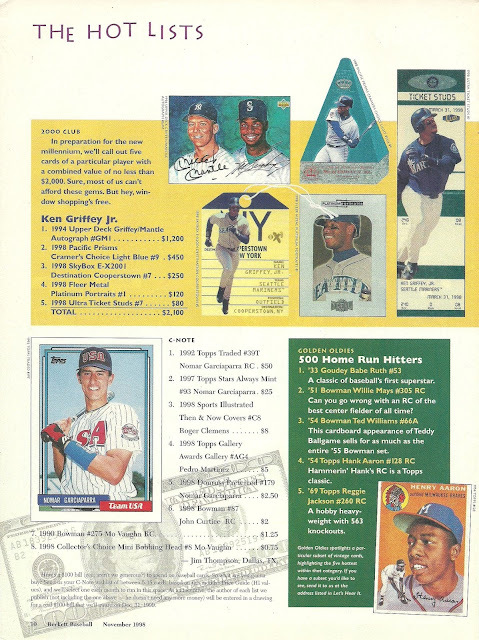 As I've mentioned previously, this particular issue of Beckett features a heavy dose of Ken Griffey Jr. and no where is it more evident then on this page. 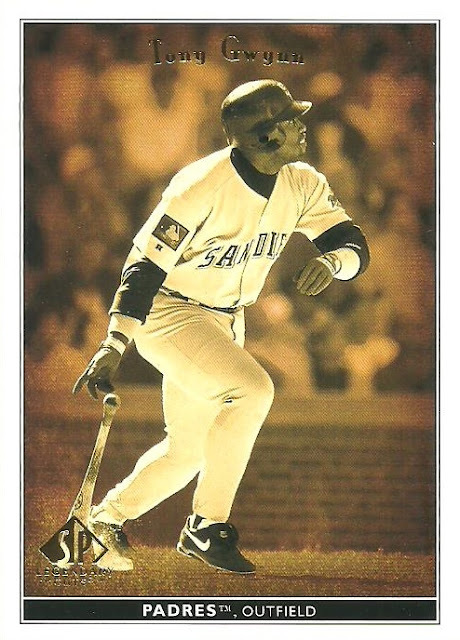 There are four different mini articles/features and all focus on Griffey. The web site listed http://www.geocities.com/Colosseum/Field/50377 in the article is not is service anymore, but it was apparently dedicated to all things Griffey. With how popular Griffey is, I fully expected there to be something in it's place, but I couldn't find anything similar to what the article described. I do want to give a shout out to all Griffey collectors out there and in particular, The Junior Junkie and his amazing Griffey collection. I always liked this feature because it gave you an idea of what you could expect if you purchased a box of that particular product. 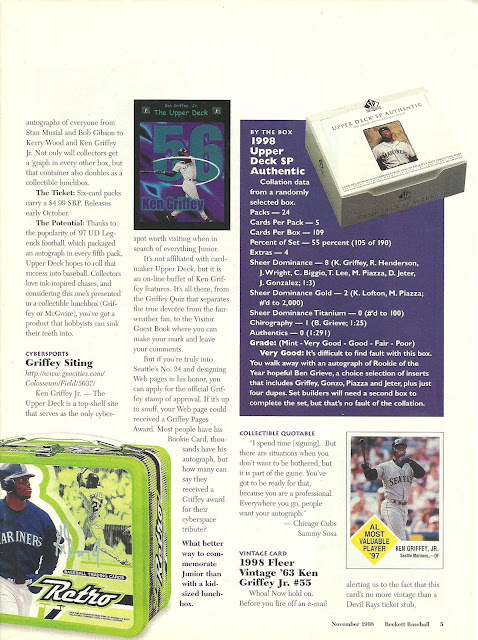 Ken Griffey Jr. is pictured on the box, just as he was with almost every Upper Deck product during this time period. I don't remember ever buying a box of this, but I have some singles in my collection. Here is a Sheer Dominance Silver card of Mike Piazza that I have in my collection. This is one of the cards that was pulled during this particular box break. Here's a Griffey from the same insert set. The autographs for this set are called Chirography. 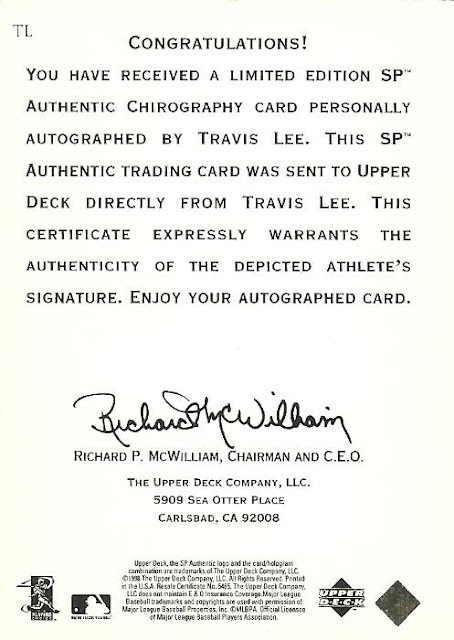 I have one Chirography card in my collection from 1998 SP Authentic. Travis Lee was a big deal back in 1998. These days his autographs can be picked up for just a couple bucks. 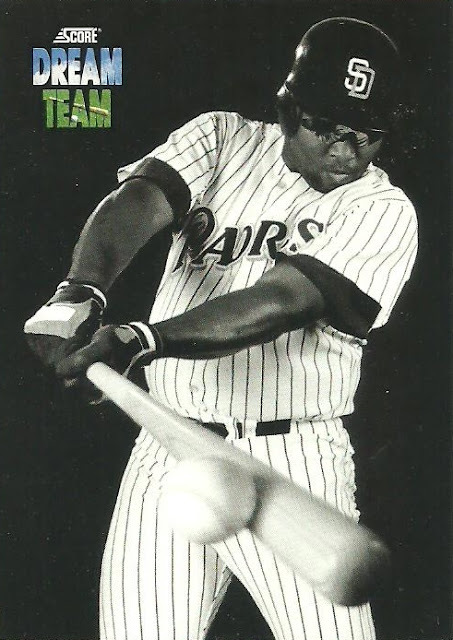 Beckett made an exception for this issue in regards to its Vintage Card feature and included a current card on a vintage design with, you guessed it, Ken Griffey Jr. I checked, but I don't have this card. It's pretty sweet looking. I need to add it to my collection. Page 4 is our first look at anything resembling an article. We get to look at some Short Prints, which as it states are "News and Notes From the Hobby World". Talkin' Baseball discusses Fleer/Skybox and it's 1998 Sports Illustrated World Series Fever insert Reggie Jackson's Picks and Pacific Trading Cards Firestone on Baseball insert set in 1998 Pacific Crown Royale. 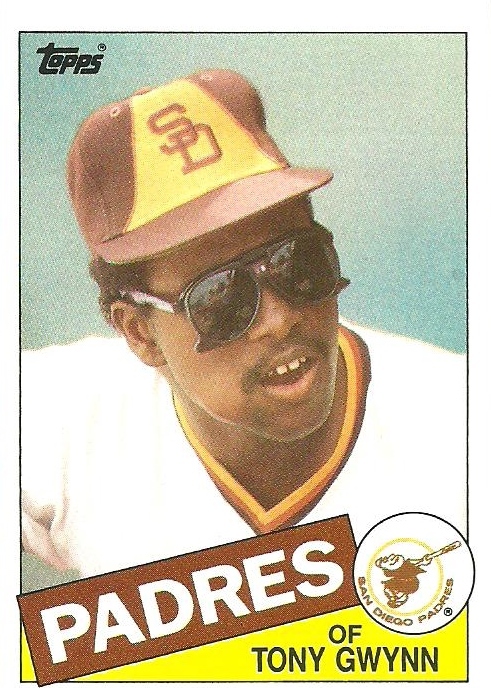 ESPN's Roy Firestone provides the commentary for Pacific and Mr. October does the same for the Fleer/Skybox product. A picture of a 1998 Pacific Crown Royale Ken Griffey Jr.Firestone on Baseball insert card accompanies the article. 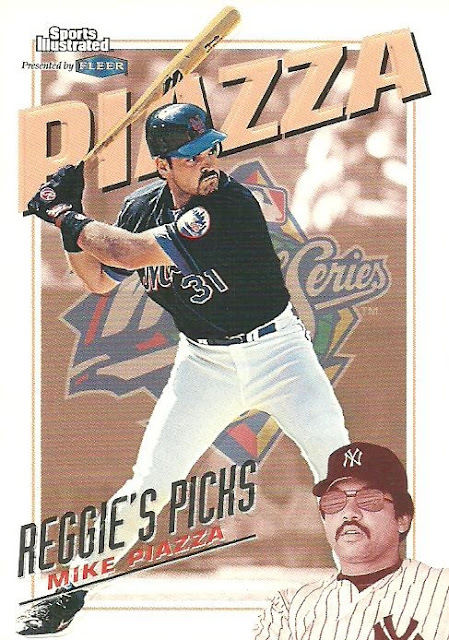 Here is a copy of a 1998 Sports Illustrated World Series Fever Reggie Jackson's Pick insert card of Mike Piazza from my collection. 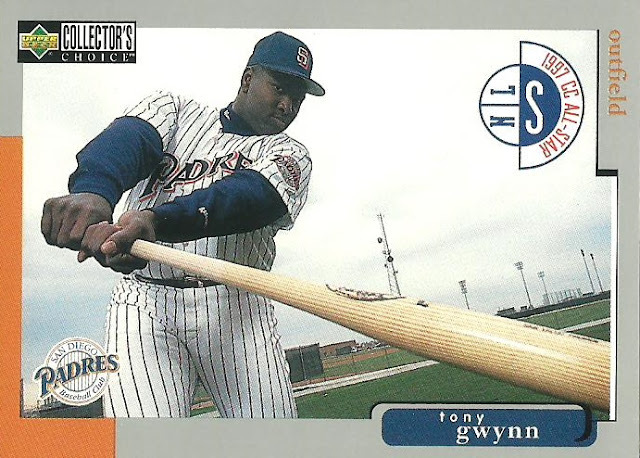 Below the Talkin' Baseball piece, we have a feature called 10 Under $10 showcasing The Best Hitter Since Ted Williams; Tony Gwynn. I don't have any of the cards on the list, so let me share my own list with a slight twist. I call it, 10 Under $0.10. These are all cards I could pick up for a dime or less. It doesn't mean they aren't fantastic though. We finish off page 4 with a Product Preview of 1998 Topps Tek and a partial Product Preview of 1998 Upper Deck Retro, which finishes on page 5. 90 different players with 90 different parallels and each parallel has a parallel. The base set is 8,100 cards in size making it the largest card set ever made up to it's printing and it remains the most massive set ever produced to this day. If you want to see the different patterns, you can take a look at all 90 versions of #78 Mark Grace. These cards are not my own. I got them from a web site devoted to Mark Grace. The parallel of each parallel are called diffractors and are silver parallels. They were seeded 1 in every 6 packs. The parallels are not numbered and no print run was ever announced, but collectors think that they are limited to between 10-20 copies of each version. Here are some of the different diffractors for the Mark Grace card, again courtesy of www.MarkGrace.com. Anyone out there working on a particular player from this set? I have some from the 1999 set, but nothing of note from the 1998 set. Okay, back to page 4. 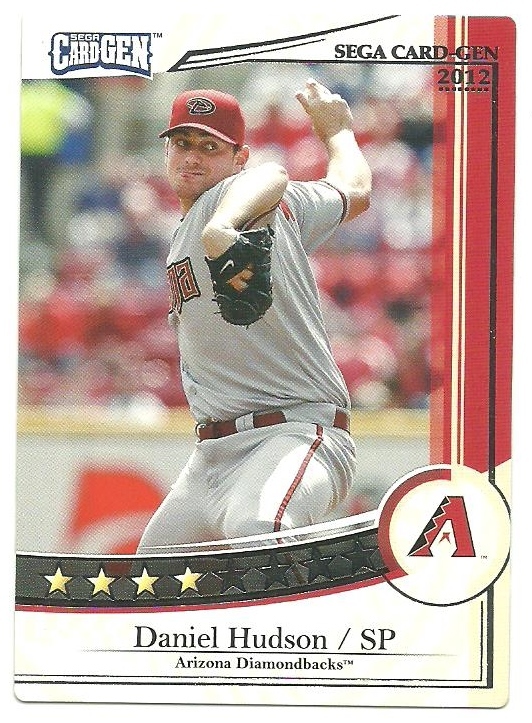 Beckett was a little off in their numbers, but I think they were given incorrect information from Upper Deck. 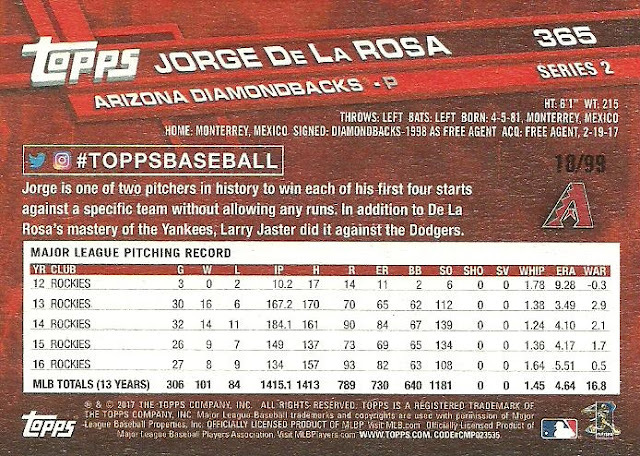 Under "The Steak" it lists 1998 Upper Deck Retro as a 130 card set, but it actually only features 129 cards. 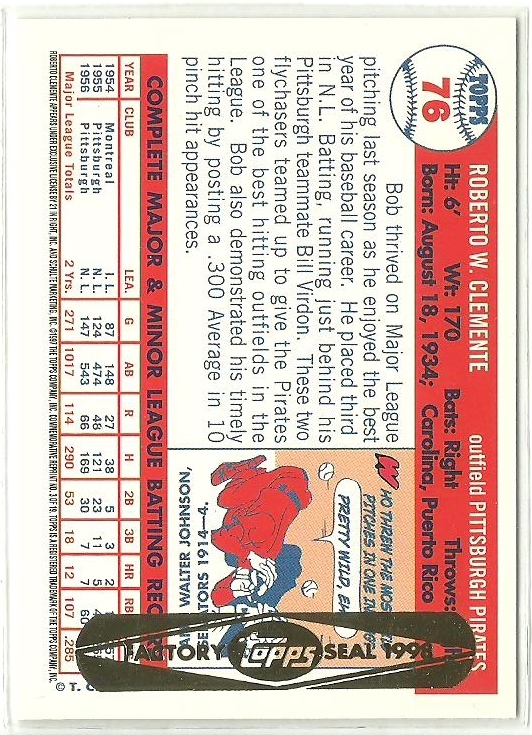 Card #82 was supposed to be Stan Musial, but due to licensing issues it was never produced. Under "The Sizzle" it lists the Sign of the Times as 30 cards and on the next page it identifies Stan Musial as one of the autographs, but his autograph never made it in the set either. 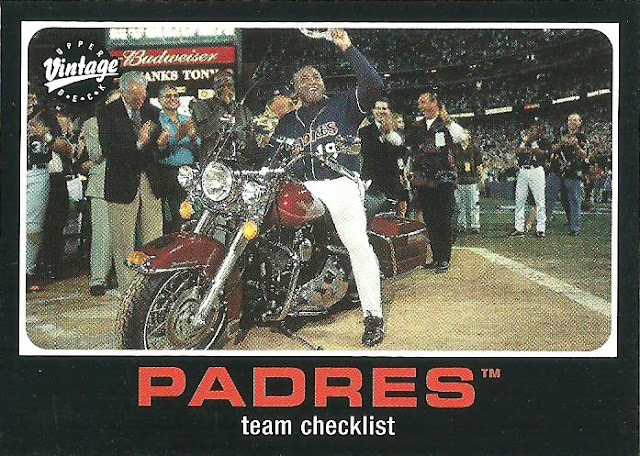 The checklist does however list 31 different cards and the quantity. Here is an example from my personal collection. It's of Travis Lee. You can see that the cards are not actually serial numbered. We'll finish the rest of the Product Preview for 1998 Upper Deck Retro tomorrow on page 5.